helloBoat has taken sunset cruises to a new level. Enjoy the best of Lisbon and the Tagus river in a comfortable and unique boat, manufactured by Lekker Boats, with excellent drinks and music on board. 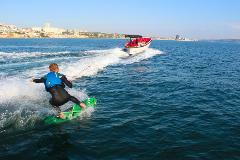 Come wakeboard in Lisbon, right in the middle of Tagus river. An exclusive helloBoat experience!